This is another take on a trifle, of course, continuing in the spirit of eating well and using up what you have. This also appeared at the international Christmas dinner, but is great for any occasion. 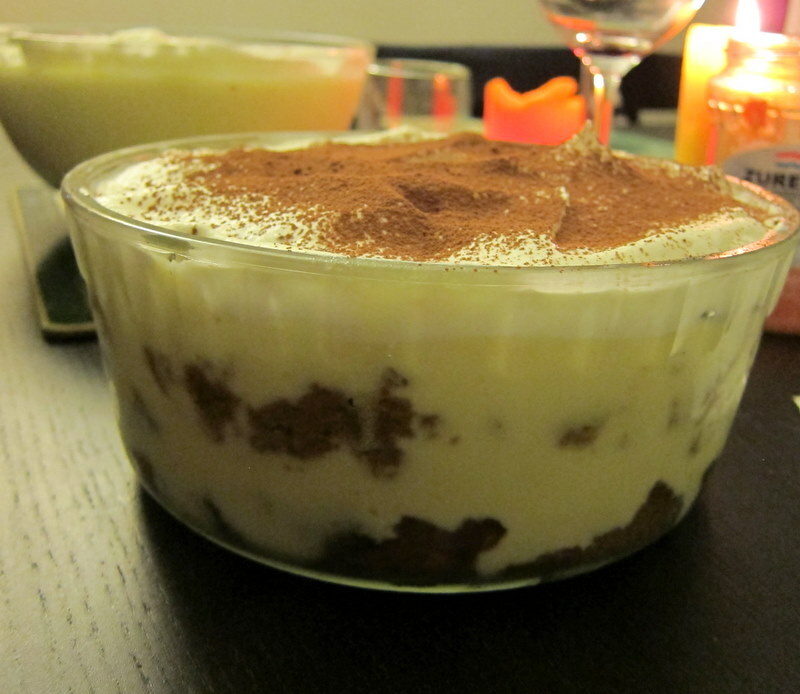 The traditional tiramisu consists of layered sponge, soaked in coffee, and a mascarpone and Marsala custard. But, I had some more spare panetone and I had made 2 l of custard, so I diverted from the original. I think that you can add a slug of Marsala, or even some Tia Maria if you want. I preferred a big smack from the coffee, and so didn’t want it mellowed in this instance. I certainly don’t think it suffered for it. If you are an improvisational cook, like I am, you will enjoy getting the most out of what you have, so may well find other, equally good things in your cupboard, or fridge. It is good to know that you don’t have to stick rigidly to the old traditions, but that you can still produce great tasting food. You never know, if it is good enough, you could be starting a tradition for yourself! Leave to cool overnight in the fridge, if you can, but at least a few hours if you forgot that you are entertaining the next day, or have a pressing appointment. Cut the panetone into strips of roughly the same size and thickness, and put in a dish, in a single layer if you can. I used a flat baking dish for this, not the final serving dish. Pour the coffee over it in as even a way as you can, you don’t want large portions of the sponge to remain untainted by the coffee. Set the panetone aside to soak for about half an hour. Once the panetone is thoroughly soaked, layer it into the serving dish (or individual glasses) so that you have sponge, custard, sponge custard. I find that this is enough for two layers, but you may get more or fewer, depending on the width and depth of your serving dish. Leave about 3-5 cm at the top, and refrigerate if you are not going to serve it straight away. Just before serving, whip up the rest of the cream, and put it in a layer on the top of your trifle. Dust with cocoa powder, and serve it to guests who have already feasted on loads of food, but they won’t be able to resist just a small bit of this too. Your recipes are always so creative and this sounds like a perfect way to use up leftovers! Thank you Heather. I really hate to throw things away.